I appear to be on a role... it seems like the majority of my projects lately have been mystery models. My latest one is no exception. 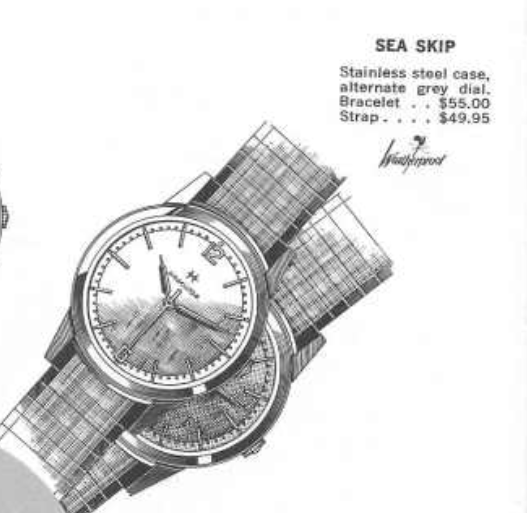 It could be another M-series watch but it also looks a lot like a Sea-something. Back in February I posted a thread on the 1962 Sea Skip. My mystery watch came to me from a "HandyDan Fan". It looks a little like a Sea Skip but it's not - there are a number of similarities but also some key differences. Thanks to a fellow collector, I now know that this watch is a 1961 M69-1. Conventional wisdom believes the the M-series was a special line that was sold through a national chain of some sort. It's not clear what chain but think along the lines of a Sears or Service Merchandise. I any event, M watches were identified by their price and the order of arrival. The line began in 1961 and run through 1967. 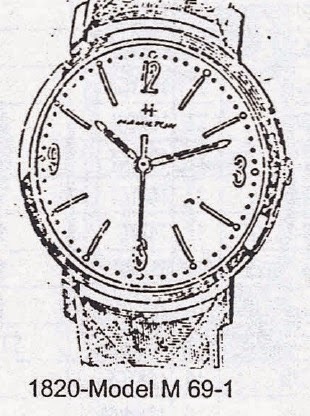 This M69-1 was the first watch to have a price of $69. $69 may not seem like but today but that's the equivalent of over $750 adjusted for inflation. So this was not an inexpensive watch. As received, it arrived without a crown and it was quite dirty. I apologize for the blurry photo but it's too late to take a new one. Although the crown is missing, the male stem is still there so all I need it a new crown of the proper size to fit the stem tube and the recess in the case. Without the crystal in the way, you can see that this dial is very dirty with a green funk around the perimeter. The dial is different from the Sea Skip... from a texture standpoint as well as the presence of a 3 and 9. The watch is also a front-loader while the Sea Skip has a screw-off back. Like the Sea Skip, this watch has a 17 jewel ETA-based 688 movement under the hood. This grade is also used in the various M-series watches I've done as well. Based on the case markings, there's no doubt this is a legitimate Hamilton model. While everything is being cleaned, I'll clean and polish the bracelet and case. I like watches with a personal inscription like this one... the watch was clearly a special gift 50 years ago. Everything is cleaned and dried before being reassembled. I was able to get the dial to look a lot better but it took careful elbow grease. I was very mindful to not lose the printing of the Hamilton logo. The reassembled movement is happily purring away so the next stop is the timer. Running 34 seconds fast per day with great amplitude and a non-existant beat error. A quick tweak of the regulator slows the timing down to just 9 seconds fast per day. I'll leave it there. The dial and hands can go back on now and I've also installed a new crown on the existing stem. All I need now is a new crystal to seal it back up. A fresh GS PHD high dome crystal in 30.4mm is the perfect replacement for this watch. And here's the finished M69-1 project. The bracelet is a Kreisler, known to be one of the makers of Hamilton's bracelets. The catalog image isn't very clear but it's hard to say if this is original or not. It obviously fits the watch just fine. The cleaned up dial isn't perfect but it looks loads better than what I started with.